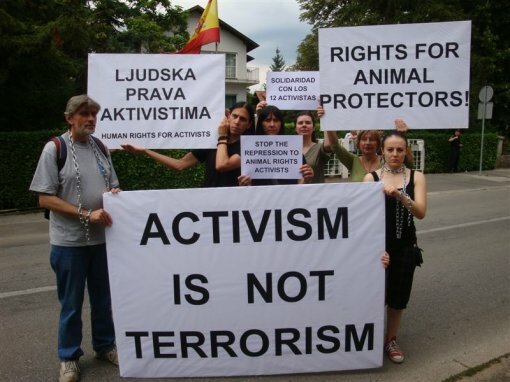 - Protest in front ot the Spanish Embassy, Tuskanac 21, Zagreb, June 30 at 1 P.M. 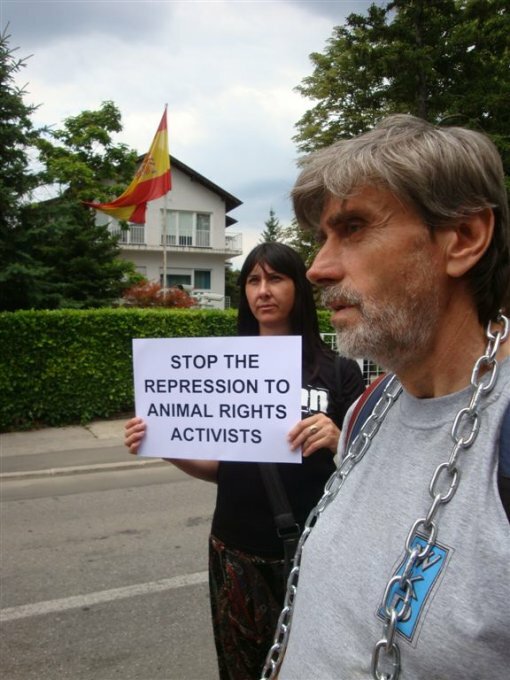 In a series of raids that took place in the regions of Madrid, Asturias, Vizcaya and Galicia on June 22, 2011, twelve animal rights activists from the legally constituted organizations Igualdad Animal/Animal Equality and Equanimal were arrested. The activists were accused of offences against the environment, public disorder, and forming a criminal organization, though they have no involvement with this. These coordinated raids in four Spanish cities were conducted as part of the investigation centred on the intentional release of 20,000 minks from the farm Visones Bermúdez, located in Santiago de Compostela, in November 2007, which would indicate the suggested damage to the environment. Both organisations have denied any involvement, while the reason for these arrests is the possible connection because of the nature of their work. Chronologically looking, between June 24 and 25 the examining magistrate from Santiago de Compostela released eight of the eleven detainees on bail with charges, while three other activists were placed on remand in custody. The only activist not yet arrested on June 28 voluntarily presented himself but has not been taken into custody and has been given his first hearing for next Monday. Three activists Jose Valle and Sharon Núñez from Animal Equality, and David Herrero from Equanimal, arrested on June 22 in Madrid, are currently on hunger strike. Expecting to go before the Magistrate's Court, they have sent the following message through their lawyer: "We are OK. This is a clear attack on antispeceisist organisations and our work revealing the horrors of animal exploitation." 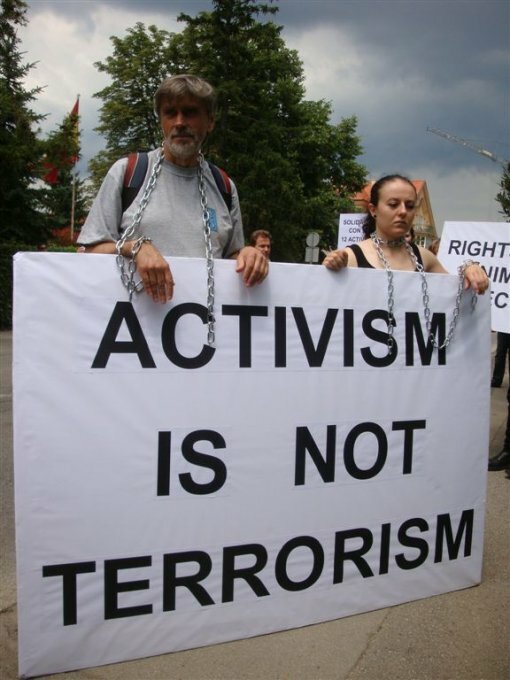 In order to show solidarity with 12 arrested activists, but also with all activists around Europe who demand freedom for their Spanish colleaugues, Animal Friends will organize a peaceful protest in front of the Spanish Embassy in Zagreb, Tuskanac 21, on June 30, 2011 at 1 P.M. Animal Equality and Eguanimal define their activism as being non-violent. They dedicate their efforts to raising public awareness of animal rights, by informing society of the consequences of consumption of animal products. Their work is transparent and public, while their activities are non-violent, their most direct actions were jumping into bullrings or interrupting fur shows. With their work they uncover the horrible truth of torturing and killing of millions of animals in the fur industry, laboratories and slaughterhouses, calling for compassion and vegan lifestyle. More information on further developments can be found at www.animalequality.net i www.prijatelji-zivotinja.hr.